Our team will arrive in La Paz, Bolivia with some great goals in mind. Their custom itinerary will allow them to explore Salar de Uyuni and climb Cabeza de Condor, the Bolivian Matterhorn. They will fly from La Paz, the world’s highest administrative capital onto Uyuni, and tour The Salar, the world’s largest salt flat, located in southwest Bolivia. They will climb Vulcan Tunipa, a dormant volcano where they will have amazing views of the Salar. Then a flight back to La Paz and head to the Cordillera Real where their sights will be set on Cabeza de Condor, one of the most striking mountains in the Cordillera Real. 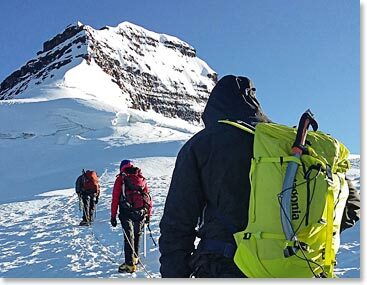 Follow along as the team sends updates from their Bolivia climbing expedition.